“Whatever you do in word or deed, do it all in the name of the Lord Jesus.” Colossians 3:17 NIV. 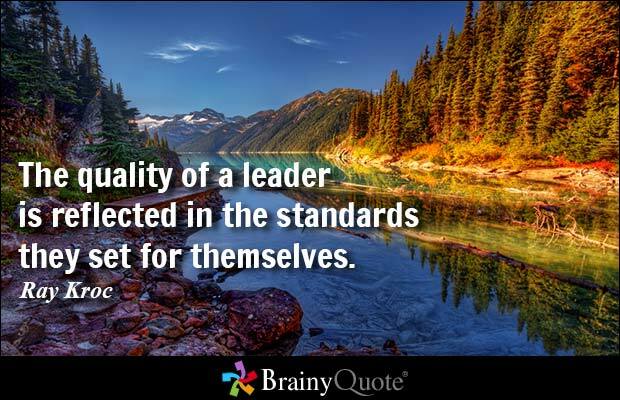 Standards are important to a worthwhile life. Standards provide a benchmark – a standard of excellence against which similar things must be measured or judged – for what you deem acceptable or unacceptable. 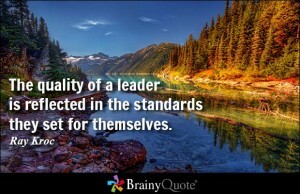 Using others as your standard is inadequate. If you don’t establish your standards, your friends or the surrounding culture will. “Bad company corrupts good character.” 1 Corinthians 15:33 NIV. A person with low standards ultimately has no standards. The Father’s intention for us is clear: “Until we all come to the unity of the faith and of the knowledge of the Son of God, to a [mature] man, to the measure of the stature of the fullness of Christ.” Ephesians 4:13 NKJV. That is a high standard, fully achievable in Christ Jesus. Maturity is your destiny in Christ. Some years ago, while teaching a Pastoral Counseling class to young Bible school students, I needed to define spiritual maturity in practical terms. This is my definition, “Spiritual maturity is rightly responding to life’s situations according to Biblical patterns of behavior.” That defines our Savior and should describe you and me. Christ-likeness should always be your choice. In any and every situation, you are presented with this choice, “Do not be conformed to this world, but be transformed by the renewing of your mind that you may prove what is that good and acceptable and perfect will of God.” Romans 12:2 NKJV. Spiritual conformation is the progression by which the Holy Spirit accomplishes that. “We know that when Jesus is revealed, we shall be like Him, for we shall see Him as He is.” 1 John 3:2 NKJV. Meanwhile, “We all, with unveiled face, beholding as in a mirror the glory of the Lord, are being transformed into the same image from glory to glory, just as by the Spirit of the Lord.” 2 Corinthians 3:18 NKJV. Maturity is much more than increasing Biblical knowledge. Maturity is the embodiment of Biblical truth woven into the fabric of daily life – how you think, what you will sacrifice, what you believe, how you behave, what you value, how you live. God’s Word and Christ’s example are high standards, not achievable apart from submission to the Lordship of Christ and dependence upon the indwelling power of the Spirit. Paul applied these high standards in simple, practical terms: bear with each other; forgive grievances; embrace love; let peace rule; be thankful; let the Word dwell in you; admonish with wisdom. Paul’s summary was, “Whatever you do in word or deed, do it all in the name of the Lord Jesus giving thanks to God the Father through Him.” Read Colossians 3:12-17 NIV. Passionately protest mediocrity; for me, that says it all. Today, I pray for you that Jesus is the high standard to which you aspire. “That you and I may be mutually encouraged by each other’s faith.” Romans 1:12 NIV. Encouragement is evidenced in conviction, confidence, and courage. Someone rightly observed, “Misery loves company.” Misery tends to choose similar company. Trust me; they will not be profitable for you and you aren’t helpful to them. Their depleted emotions further diminish yours. Encouragement is less about emotions and more about positive actions. Encouragement is evidenced in your conviction, confidence, and courage. I suggest three practical sources of encouragement. Learn to encourage yourself in God and His Word. “Let the word of Christ dwell in you richly in all wisdom, teaching and admonishing one another in psalms and hymns and spiritual songs, singing with grace in your hearts to the Lord.” Colossians 3:15-17 NKJV. Betrayed, deposed, and driven from Jerusalem by his rebellious son, Absalom, “David was greatly distressed . . but David encouraged himself in the Lord his God.” 1 Samuel 30:6 KJV. The Word of God has power to heal your emotions, calm your fears, and refresh your heart. Read Psalm 19:7-10 NLT. The Word of God and the grace of God is sufficient whatever your season or circumstance. The Apostle Paul describes such moments, “May our Lord Jesus Christ and God our Father, Who loved us and by His grace gave us eternal encouragement and good hope, encourage your hearts and strengthen you in every good deed and word.” 2 Thessalonians 2:16-17 NIV. The Scriptures refocus your attention on Jesus; Jesus is the great Encourager. See Romans 15:4-5 NIV. Choose to be an encourager to others. “I long to see you so that I may impart to you some spiritual gift to make you strong – that is, that you and I may be mutually encouraged by each other’s faith.” Romans 1:11-12 NIV. Is there anything you give others more valued and mutually rewarding than the gift of encouragement? You can’t encourage others when you are discouraged. Sow encouragement; reap encouragement. Encouragement returns from those you have encouraged. There is a familiar, but often misapplied, Biblical principle of generosity that is true in every application. “If you give, you will receive . . Whatever measure you use in giving – large or small – it will be used to measure what is given back to you.” Read Luke 6:37-38 NLT. Notice that the surrounding context is relational rather than monetary. Seek the company of those whose lifestyle and fellowship encourage you. “Your love has given me great joy and encouragement, because you, Philemon, have refreshed the hearts of the saints.” Philemon 1:7 NIV. Everyone needs fresh courage for the day and its demands. Life can be mentally, emotionally, and spiritually depleting, leaving you empty of energy and optimism. Days, even seasons, can feel disheartening. At such times, people who are emotionally and spiritually healthy refresh your courage. “And so we will be with the Lord forever. Therefore encourage each other with these words.” 1 Thessalonians 4:17-18 NIV. Also see Hebrews 10:25 NIV. Today, I pray that you will aspire to be an encourager, and refreshed in doing so. “What we suffer now is nothing compared to the glory He will give us later.” Romans 8:18 NLT. Job’s story was written to show God’s faith in Job, not Job’s faith in God. First let me say, I do not presume to know all the answers about suffering. But this I know, God sorrows when we suffer. For any of us, suffering presents more questions than provides answers. In the Bible, a whole book is about the suffering of Job, a man the God described as, “blameless, a man of complete integrity. He feared God and stayed away from evil.” Job 1:1 NLT. Very few, if any, have experienced the breadth and depth of loss and pain that Job suffered. Read Job 1:13-2:10 NLT. And therein is the dilemma for most of us. We assume suffering is the natural result of our own wrongdoing or the fault of others. Admittedly, those often do cause suffering. But how do you explain suffering where there is no fault to be assessed? Amid the pain of suffering there are questions and uncertainties. In the truth of God’s Word and His righteous character, you will find rest for body, mind, and soul. “Not only so, but we also rejoice in our sufferings, because we know that suffering produces perseverance; perseverance, [produces] character; and character [produces] hope.” Romans 5:3-4 NIV. This week, a pastor and friend, Dennis, shared an inspiring insight about the sufferings of Job. Let me share an excerpt with you. “The patriarch Job had lost his possessions, family, friends and health, Satan himself tried to take his mind. Chapter after chapter, Job anguishes over the hopelessness of his life. He asked the question we all ask, ‘Where is God in all of this?’ Unlike you and me, Job really had lost everything. He really was hopeless. Even his wife and friends’ advice was, ‘Give up, curse God and die.’ So where was God? You have to go back to the beginning of the story. The devil had presented a challenge to God, saying he could destroy the faith of God’s servant. God accepted the challenge and allowed Satan to attack everything that Job had, except his life. Read Job 1:6-12 NLT. In a nutshell that is the story. But underneath the story is a truth that is missed by most. A casual glance would say that God was testing Job’s faith to see if he could stand in the crisis. That is not the case. Job’s life-story was not written to show his faith in God, but written to show God’s faith in Job. Think about it. Satan challenged God that he could destroy the righteous believer’s faith. God chose one man to be tested, Job. In essence, God places all of His faith in that man to stand in the day of trouble. God believed the very best in Job – in fact, He believed in Job more than Job believed in himself. Since God has faith in you, maybe it’s time to put your faith in Him.” Dennis Gallaher, ActLikeMenBlog. If you could hear the conversation about you in Heaven, you would not doubt your strength in Christ to persevere. This is the perspective God honors, “What we suffer now is nothing compared to the glory He will give us later.” Romans 8:18 NLT. Your story is being written to show God’s faith in you, not your faith in God. Stop trying to have faith that impresses God. Start living a life that pleases God; give God reason to have faith in you. “Praise be to the God of all comfort, Who comforts us in all our troubles.” Read 2 Corinthians 1:3-10 NIV. Here is Peter’s perspective on righteous suffering, “For this is commendable, if because of conscience toward God one endures grief, suffering wrongfully. For what credit is it if, when you are beaten for your faults, you take it patiently? But when you do good and suffer, if you take it patiently, this is commendable before God. For to this you were called, because Christ also suffered for us, leaving us an example, that you should follow His steps.” 1 Peter 2:19-21 NKJV. Today, I pray for you to persevere in suffering, assured of the character and faithfulness of your God. “Let the morning bring me word of your unfailing love.” Psalm 143:8 NIV. Morning brings a fresh start to what we call life. I am not naturally a morning person, but I anticipate the mornings I write these devotionals. This morning I was inspired by a simple prayer from a Psalm of David. 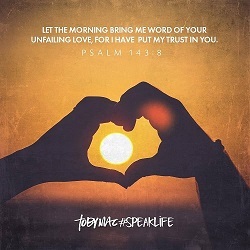 “Let the morning bring me word of your unfailing love, for I have put my trust in you.” Psalm 143:8 NIV. Imagine your restful night and anticipated morning when those are your final thoughts and prayer each night. “Satisfy us in the morning with your unfailing love that we may sing for joy and be glad all our days.” Psalm 90:14 NIV. Now that’s what I would consider a good morning indeed. “There are two ways to wake up in the morning. One is to say, ‘Good morning, God.’ The other is to say, “Good God, morning!’” Bishop Fulton J Sheen. Which best describes you? Your morning can set the tone for your day, either to be disciplined or disinclined. David prayed, “O God, You are my God; early will I seek you; my soul thirsts for you.” Read Psalm 63:1-7 NKJV. Be positive and proactive. Your attitude and anticipation each morning either empowers or diminishes your attempts and accomplishments throughout that day. Mornings are important. Every morning offers unforeseen opportunities and fresh starts. “In the beginning God created the Heavens and the Earth . . And there was evening, and there was morning.” Read Genesis 1:1-31 NIV. I think that statement refers to more than simple chronology. Following and introducing every succeeding act of creation, the same phrase is repeated, “And there was evening and morning,” suggesting to me a satisfaction for accomplishment and preparedness for new tasks. There is a natural rhythm to life. Morning brings a fresh start to what we call life. “All the days ordained for me were written in Your book before one of them came to be.” Psalm 139:16-17 NIV. God’s fingerprints are all over your day. What then should be your attitude upon awaking? The Bible suggests this be your attitude, “This is the day the Lord has made; we will rejoice and be glad in it.” Psalm 118:24 NKJV. Attitude determines altitude – how high you rise in the day that awaits you. Every morning offers you first day of the rest of your life. Usually, you find what you are looking for; look for God to bless your day and rejoice in anticipation accordingly. “The steps of the godly are directed by the Lord. He delights in every detail of their lives.” Psalm 37:23 NLT. Today, I pray for you good mornings with fresh reminders of the Lord’s unfailing love. “The Lord made all that Joseph did to prosper in his hand.” Genesis 39:3 NKJV. Adversity around you will not prevent God’s blessings upon you. It never seems a person has enough money, so it is important that you learn some basic things about handling the money you have. God’s principles remain true and effective whether you have little or much. My Dad taught me to, “always live within your means and always save something for later.”That is a Biblical principle of stewardship. That isn’t always the easiest thing to do, but it is always the best thing to do. See Proverbs 21:20 NIV. Gayle and I have done that for all of our married life, when we made less and when we made more. We have chosen to live without credit card debt and been very careful about long-term debt. Before our marriage, my Dad recommended allocating a fixed percentage of income for housing expenses as a helpful guideline to keep expenses in proportion to income, not allowing expenses to grow without proportional income. It’s simple really. The world’s economy cannot provide you with Kingdom prosperity. God’s blessings provide prosperity. Joseph found himself in adverse circumstances – sold as a slave, indentured as a servant, and in a foreign land. “His master saw that the Lord was with Joseph and that the Lord made all he did to prosper in his hand. So Joseph found favor in his sight, and served him.” Genesis 39:1-6 NKJV. Joseph prospered in extreme adversity. 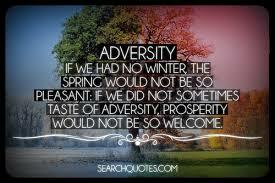 Adversity around you will not prevent God’s blessings upon you. God intends the same for you. “Beloved, I pray that in all respects you may prosper and be in good health, just as your soul prospers.” 3 John 1:2 NASB. Governments assume that giving taxpayers’ money to large banking corporations and requiring them to lend money to assure sufficient funds circulating in the economy can solve the problem. Actually, that fuels the source of the problem. The common wisdom – ill formed and wrongly believed – is that if everybody will spend more, we can borrow and buy our way out of the predicament. That is a false cure, temporary and shortsighted. The wheels of commerce are greased by the principle of leverage through a cycle of borrowing and growing debt. Debt is addictive and destructive. It doesn’t work for a nation, nor for your household. Our country is in economic distress through mounting debt, which merely reflects a financial mess many of us have made for ourselves. Readily available credit does not make it wise. Availability is not the same as affordability. Families have chosen a lifestyle of debt in a culture that encourages and enables your doing so. When tempted to spend beyond your means, consider the financial, marital, and eventual emotional cost. God will not bless your mess. Begin putting God first. Malachi 3:8-12 NLT. Everything you have belongs to God; you and I are stewards. Use wisely what God provides, always thankful for His blessings. “Blessed are all who fear the Lord, who walk in His ways. You will eat the fruit of your labor; blessings and prosperity will be yours.” Psalm 128:1-2 NIV. Today, I pray that you earn diligently, save regularly, spend wisely, and give generously.